...costs less than a couple of private banjo lessons! If you want to save a lot of dough and get your banjo playing off the ground in a hurry, consider getting the complete system and you'll save $$$. 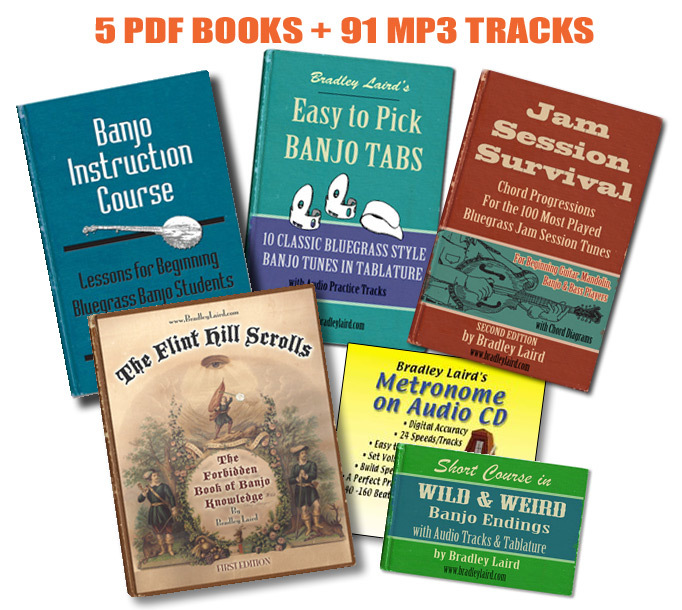 • Free Bonus: My Banjo Chord Workshop video presentation is included with this download. This goes hand in hand with The Flint Hill Scrolls. The material in this complete system is equal to a year of weekly banjo lessons with a good private instructor. That would cost you $1,040 (at $20 a lesson) and you might forget most of what the teacher shows you before you get home. The money you save could buy you a really nice new banjo! Save $15 When You Order This Download Package. $40 Value for Only $25!